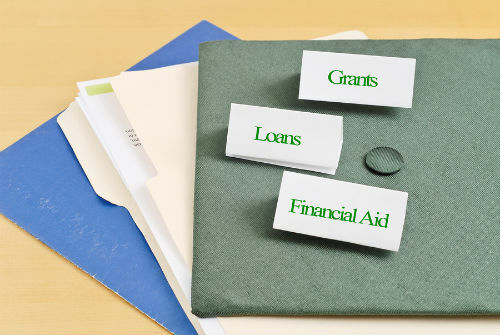 How Can I Complete School if I Run Out of Financial Aid? Q: How can I complete school if I run out of financial aid? Should I get a private student loan? A: Well, the answer to this question is somewhat of a complex one and for those of you who don’t know, I have written a whole book about student loans and essentially how to pay them off. It is called “Zero Debt for College Grads: From Student Loans to Financial Freedom." When I went to graduate school, I came out of school with about $40, 000 in student loan debt, so I know what’s it like to have to get loans in order to finance your college education. But to answer the question directly, no, I don’t think that running out of financial aid in and of itself is a pure obstacle to you completing school. I think a lot of times people haven’t considered all of the alternatives to loans when it comes to paying for their college cost. Here and are five alternatives to student loans. One certainly is scholarships, two is grants, three is paid internships, four is work study programs and then five is whatever family resources you can marshal up. By family resources, if it is not your own money, maybe mom and dad can kick in some money, maybe grandma, uncle Joe, whoever might be willing to throw some dollars your way to help pay for books, tuition, fees, computer, supplies, room and board, tuition, whatever it is that you have run short of in terms of having the money to pay. On the scholarships and grants front, far too few people really aggressively seek out scholarships. I tell students that you should put in three to four weeks worth of search effort; 20 to 30, maybe even as much as 40 hours over the course of those three or four weeks. I know it sounds like a full time job, but trust me, you are going to get a great payoff down the road. And the payoff is, you won’t have to borrow so much in student loans and you will save yourself potentially as much 15 years worth of repaying that college debt. And 15 years by the way is in fact the average repayment period right now for student loans according to the College Board. A great resource is FastWeb.com, which is a search engine that will let you seek out the billions and billions of dollars in scholarships that are out there that are available for students. You enter some information about yourself, your background, your educational interests, your academic pursuits, etc., and it will match you up for scholarships for which you qualified. The scholarships are based on a whole host of things, everything from, again, how well you have done in school and your grade point average to your ethnicity or background, your gender, perhaps your parents’ job, where you live, your career interests, etc, a whole host of criteria. But do aggressively seek out those scholarships and grants. Regarding your question about the private loans, I always tell people to seek out federal student loans first. And, of course President Barack Obama earlier in 2010 signed Student Loan Reform as part of the Healthcare Reform Bill. Essentially, it means that a lot of people are going to go direct to the government to borrow for college as opposed to going to private lenders. The reason I suggest federal loans first before private loans is that federal loans typically have lower interest rates. You will be able to get one right now for maybe 6.5 percent or less as opposed to some private loans, which might be 8, 10, 12 percent or so depending on your credit and whether or not you have a co-signer. Federal loans also have lower fees. They have better loan forgiveness options, better forbearance options, and better deferment options if down the road when you are supposed to be in repayment, you need to put off those student loan payments. If after you have pursued federal student loans and you have maxed out those federal loans and then you still need to get loans, then that’s the time that you should go ahead and seek out those private loans.